74 Temple hadn’t beaten Penn State in more than 74 years, but the Owls finally broke that streak with their 27-10 win over the Nittany Lions. Temple’s defense dominated the line of scrimmage against Penn State QB Christian Hackenberg and his offensive line. The Owls compiled an astonishing 10 sacks, forced nine punts and allowed only 11 completed passes by Hackenberg. Entering the game, Penn State had gone unbeaten against Temple in 39 games since 1941, which was the longest active win streak against one team and fourth longest of all time. 29 Nebraska’s streak of 29 consecutive season opener wins came to a close after BYU’s Hail Mary defeated the Cornhuskers. The last time Nebraska lost a season opener was back in 1985 to Florida State. The Cornhuskers lost to the Seminoles 17-13, but started the previous streak with a win over FSU the following year. During its streak, Nebraska averaged 45.1 points per game but managed only 28 in the BYU loss, its lowest point total in a season opener since 2005. Now, the distinction of consecutive season opening wins belongs to Florida, who has won 26 straight openers. 31 Portland State headed into its game a 31-point underdog to Washington State. The Vikings scored 24 points in the second half and finished the game on an interception to upset the Cougars 24-17. The victory marked the program's first win over Pac-12 school in 16 tries. It also was Portland State's third win in 35 games against FBS opponents and handed Washington State its first loss to a FCS team in 20 games. 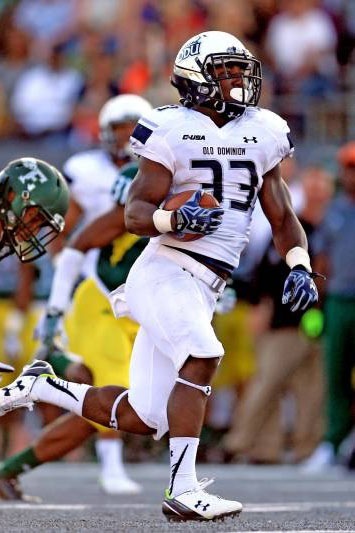 223 Old Dominion’s Ray Lawry rushed for 223 yards on 28 carries and added four touchdowns in his team’s 38-34 victory over Eastern Michigan. Two of his touchdown runs went for 54 and 45 yards, the latter to give the team the win in the final two minutes. His carries were the third most in school history and was just one yard shy of tying school record for rushing yards in a game. 351 UCLA freshman QB Josh Rosen went 28-of-35 on passing attempts and threw for 351 yards and three touchdowns in his debut for the Bruins. The freshman phenom spread the wealth among Bruins receivers, throwing to 11 different targets. His performance was enough to already receive Pac-12 Offensive Player of the Week. Rosen's performance also stacked up against other performances of true freshman quarterbacks in their debuts. 723 Baylor’s offense combined for 723 yards on 69 plays in its game against SMU to average a school record 10.48 yards per play. In the passing game, 423 yards was the third-most in a road game in program history. QB Seth Russell contributed much to the total yardage as he averaged 25.1 yards per completion and had five passes that were more than 40 yards. Russell also accounted for six touchdowns, tying a school record for most TDs in a single game. It was the second time in his career at Baylor he has combined for six touchdowns, joining Blake Szymanski [2007 Rice], Robert Griffin III [2011 Rice], Nick Florence [2012 WVU] and Bryce Petty [2014 TCU]. Baylor closed its win over SMU on a 28-0 run. 8 Several made their debuts as new/interim head coaches. They went 8-8 in Week 1. ... 10 Virginia Tech hasn't defeated a No. 1 team in 10 tries; 10 SEC teams were ranked in AP Poll, most ever by a conference. ...16 Consecutive season openers Ohio State has won, going back to 1999. ... 20 Texas has been outscored 117-20 in its last three games dating back to last season. ... 23 Minnesota's defense allowed only 23 points to a TCU team that averaged 46.5 ppg last year. It was the Horned Frogs' lowest score total since Nov. 9, 2013. ... 25 Teams scored 50 or more points in their openers, with three passing the 70-point mark [Ole Miss, California, Middle Tenn.] ... 82 Auburn’s 82-yard fumble return for a touchdown is the longest for the Tigers since 1969. ... 99 Rushing yards by Cardale Jones a career-high for the QB. ... 485 Oregon rushed for 485 yards in its opener against Eastern Washington. Georgia Tech finished behind with 476 yards but averaged 9.15 yards per rush. ... 2002 Arizona CB DaVonte Neal blocked the first field goal for the Wildcats since 2002. ... 64,279 Attendance number at AT&T Stadium in Arlington for Alabama-Wisconsin.